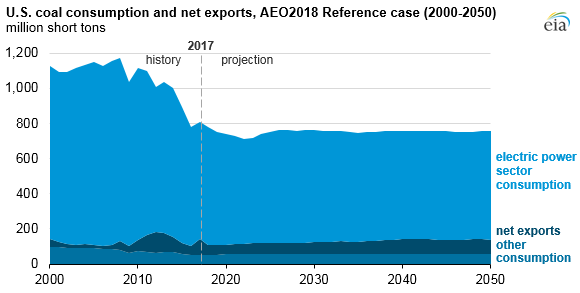 EIA projects U.S. coal disposition—domestic demand and coal exports—to remain relatively flat through 2050 in the Annual Energy Outlook 2018 (AEO2018) Reference case, even as many coal-fired power plants are retired. Coal disposition for the next three decades averages 750 million short tons per year (MMst), down from the peak of nearly 1.2 billion tons in 2008. Coal demand in the power sector is sensitive to changes in the price of natural gas, and two sensitivity cases with higher or lower natural gas prices show the effects of this relationship. The AEO2018 Reference case is based on current laws and regulations. Changes in policy could significantly affect coal use. Overall, coal disposition is mostly affected by changes in the electric power sector, where 82% of domestic coal was consumed in 2017. U.S. power sector consumption of coal depends on the amount of coal-fired generating capacity and the utilization rate of that coal generation fleet. Coal’s competition with other electricity-generating fuels, in particular natural gas, has implications for both capacity retirement and utilization decisions. At the end of 2017, coal-fired generation capacity in the United States totaled 260 GW, down from a peak of 310 GW in 2011. At least 25 GW of coal-fired capacity will retire within the next three years (2018–2020), according to planned retirements reported to EIA. In the AEO2018 Reference Case, coal-fired electricity generation capacity is projected to decline by 65 gigawatts (GW) from 2018 through 2030, with virtually no retirements from 2030 through 2050. Although no new coal-fired power generation capacity is built in the AEO2018 Reference case, coal-fired electricity generation is expected to remain relatively flat as coal plant retirements slow and utilization of the remaining coal fleet increases from 56% in 2017 to near 70% by 2030—similar to the average utilization rate in the early 2000s. Electricity generation from coal is now second to natural gas, which surpassed coal as the leading source of U.S. electricity generation in 2016. In the AEO2018 Reference case, despite relatively few retirements and higher utilization, coal’s share of total U.S. electricity generation declines from 31% in 2017 to 22% in 2050 as natural gas and renewable generation sources increase their generation shares. 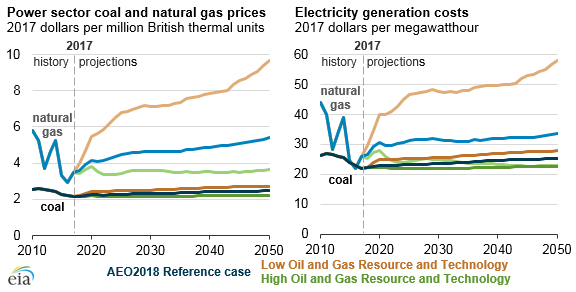 Natural gas costs more than coal on a heat-content basis, averaging $3.47 per million British thermal units (MMBtu) in 2017 compared with coal’s $2.15/MMBtu. However, because natural gas plants are typically more efficient, the cost of generating electricity from a natural gas plant is much closer to that of a coal plant. In 2017, the cost of generating with natural gas averaged about $26 per megawatthour (MWh) compared with coal’s $22/MWh. The Low and High Oil and Gas Resource and Technology cases in the AEO2018 illustrate the effect of higher and lower natural gas prices on coal generation. In the High Oil and Gas Resource and Technology case, lower natural gas prices lead to more coal retirements. In this case, 85 GW of coal plants retire by 2030, and another 18 GW of coal plants retire by 2050. Coal drops to 14% of total generation by 2050, and the utilization rate for coal plants remains under 60% throughout the projection. In the Low Oil and Gas Resource and Technology case, higher natural gas prices result in fewer coal retirements because coal-fired generation is more competitive with natural gas-fired generation. In this case, only 44 GW of coal capacity retires by 2030, and similar to the Reference case, virtually no coal plants retire from 2030 through 2050. Coal generation declines to 26% of total electricity generation, which is not as much as in either the Reference case or the High Oil and Gas Resource and Technology case, and the utilization rate for coal plants stays higher than 70% from 2021 to 2050. Other components of U.S. coal disposition are less sensitive to changes in natural gas prices and remain nearly equal to current levels through 2050. In 2017, U.S. net exports of coal totaled 89 million short tons (MMst), making up 11% of U.S. coal disposition. The remaining 7% (53 MMst) of coal disposition is consumed for commercial, institutional, and industrial uses. Metallurgical coal represents about one-third of non-power domestic coal consumption and about one-half of coal exports. After subtracting the low levels of coal imports from coal exports, U.S. coal disposition essentially equals U.S. coal production.